They are open Monday - Saturday 8am - 4:30pm excluding holidays. 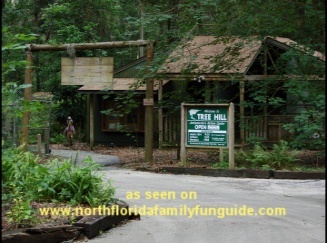 Tree Hill Nature Center is a wonderful 50 acre nature discovery park in Jacksonville, Florida! This Nature Center has a large indoor Natural History Museum, with live animal exhibits, and interesting interactive learning stations. There are also outdoor education stations, and acres of hiking trails. Live animals on site include, snakes, turtles, fish, alligators, lizards, frogs, armadillos, goats, chickens, an owl, a butterfly sanctuary, and a hummingbird garden! Tree Hill Nature Center is perfect for a troop, club, homeschool or science class field trip! Teacher workshops on a variety of environmental themes are also available. Jamy Rose, a Florida Master Naturalist, is available for a Live Animal Encounter Program, where kids can get an up close and personal look at some of Florida's native animals. This 45 minute show is an unforgettable learning experience for your growing natural scientist! Call Jamy at 904 724 4646 at least a week in advance to schedule your group's Animal Encounter adventure! On Saturdays at 10am, bring your family for family day at Tree Hill Nature Center, with a tour of the Tree Hill nature trails. Cost is $5 per family! We loved it here, and plan on coming back for more nature adventures in the future!! !